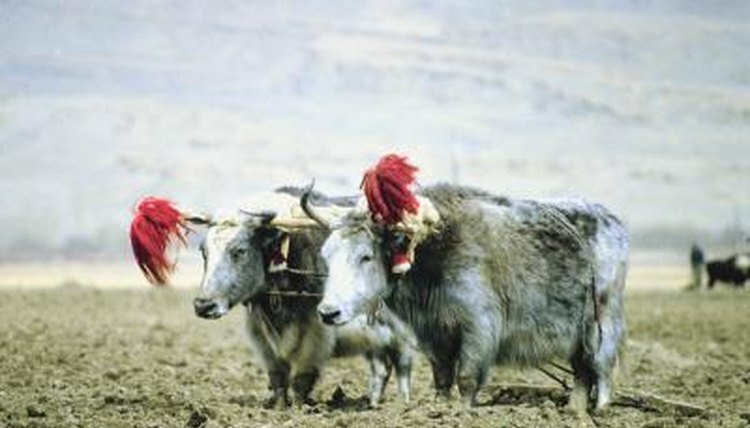 In the wild, the yak, Bos grunniens, lives on the Tibetan plateau. Domestic yaks have been introduced to many areas. These grazing herd animals grow as large as 2 tons and 10 feet long. Yaks are members of the Bos genus, which comprises oxen and true cattle. Therefore, close relatives of the yak include all other species in that group. The gaur, Bos frontalis, is covered in fur ranging from dark reddish brown to nearly black, and it has white legs. Gaurs graze in forests and nearby grasslands in Nepal, India and southeast Asia. These cattle weigh 1 to 2 tons and are 8 to 10 feet long; males are approximately 25 percent larger than females. Gaurs have a hump of raised muscle over their shoulders. Both sexes have horns, although males' horns tend to be longer. Southeast Asia is home to the banteng, Bos javanicus. These cattle graze farther from water sources than do gaurs, and they migrate to higher ground during the monsoon season. Smaller than either the yak or the gaur, they grow to around a ton in weight and 7 feet in length. These reddish-brown animals are noted for their trim physiques and short, crescent-shaped horns that point inward. The kouprey, Bos sauveli, might be extinct. Historically this animal grazed in forests throughout eastern Thailand, southern Laos and western Vietnam. Kouprey have dark brown or black fur and are roughly the same size as bantengs. Both sexes have horns, although the female’s are roughly half the length of the male’s. A few kouprey might survive in eastern Cambodia. Perhaps the most well-known species of the Bos genus is Bos taurus. These domesticated cattle are found throughout the world. This species is also the most diverse of all Bos species. Cattle fur is any shade of white, brown, red or black, and any combination thereof. Cows range anywhere from 300 pounds to 3 tons. People use them as beasts of burden and raise them for meat and dairy production.